I have taught face-to-face and online courses and developed materials and curriculum in various undergraduate and graduate programs since the beginning of 2011. I enjoy integrating my research interests in the concept and application of open source technologies, philosophy and Web design with my courses, and have used and developed cutting-edge learning technologies for my classes. 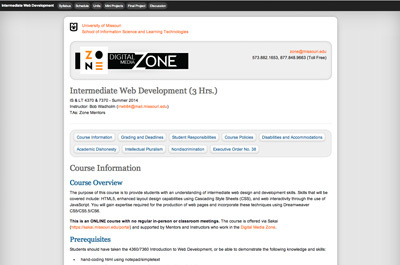 In 2013-2014, I was the manager over other instructors at the Digital Media Zone, providing them with direction, mentoring, and feedback on their course materials and delivery. I am currently an associate professor of information systems and philosophy at Trinity Bible College & Graduate School, a small private college in North Dakota. I am developing the curriculum for the Information Systems (IS) program, and teach courses online and face-to-face in the areas of IS, philosophy, theology, biblical studies, and English, and am a learning technologies consultant. I hope to continue teaching and working in this program for the rest of my career, as I see a need for ministers to be able to be proficient in new media production, critical thinking and deep reflection, as well as to be able to support themselves in poor rural areas through Web related work. My educational and research background helps make me an ideal fit for my current position. My publications center on assessment, analytics, hermeneutics, open source, philosophy and theology, all of which integrate with information science and learning technologies. I have written several books, and have presented at diverse conferences on learning, knowledge and hermeneutics. In the area of information science and learning technologies, I have been involved in research projects at MU in the areas of automated analysis of philosophical and religious texts, automated chat activity analytics, analysis of Massive Open Online Courses, assessment of pedadogical usability, and evaluation of a certification program. In my research, I often focus on the intersection of technology, philosophy, and hermeneutics. Using technology, I have attempted to automate analysis of texts (including chat logs and Twitter feeds for online learning analytics) and to display themes and organization of compositions in various texts. I also enjoy analyzing philosophical issues in technology with a focus on open knowledge. A background in biblical hermeneutics and philosophy informs my computational analyses of ancient texts in various languages, and this allows me to integrate strands of my formal education across fields with my research in information science and learning technologies. Philosophy figures large in my research and in my coursework. I use philosophy as a lens for understanding the fields of information science and learning technologies, and use information science and learning technologies concepts and applications as a way to analyze and understand philosophy. In the summer of 2014 I published a collection of essays on metaphysics, epistemology, ethics, aesthetics, and scientific research titled Essays in Philosophy. Topics include situation ethics, pacifism, use of formal language in the writing of research reports, complexity theory, arguments about ontology, skepticism, dogmatism, and the aesthetic attitude. These essays help to provide a basis for philophical discussion in more applied areas such as the ontology, epistemology, and the ethics of information, and highlight my particular style of philosophical analysis. Much of this book was written throughout my PhD coursework at Missouri University. On hermeneutics, 2017 (also available as free PDF & Word versions). Essays in biblical interpretation, 2005. An apologetic of signs and wonders in Luke-Acts, 2005. Wadholm, B. (2018). Homesteading the noosphere: The ethics of owning biological information. Northern Plains Ethics Journal, 6(1), 47-63. Wadholm, R. (2016). The open extension of Pentecostal education and the interactive Web. The Pentecostal Educator, 3(1), 29-37. Xing, X., Wadholm, R., Petakovic, E., & Goggins, S. (2015). Group learning assessment in CSCL: Developing a theory-informed analytics. Educational Technology & Society, 18(2), 110-128. Kwon, S., Wadholm, R., & Carmody, L. (2014). Assessing competencies: An evaluation of ASTD’s Certified Professional in Learning and Performance (CPLP) designation. Evaluation & Program Planning, 44, 48-58. Wadholm, R. (2019, March). Anointed to philosophize: A translation and Pentecostal reception of Peter Abelard ’s Soliloquy. Paper presented at the 48th Annual Meeting of the Society for Pentecostal Studies, College Park, MD. Wadholm, R. (2018, September). Homesteading the noosphere: The ethics of information ownership and development of biological entities. Paper presented at the NDSU and Concordia College Philosophy Conference, Fargo, ND. Wadholm, R. (2017, March). The stranger in Athens: Echoes of Plato’s Sophist and Statesman in Acts 17. Paper presented at the 46th Annual Meeting of the Society for Pentecostal Studies, St. Louis, MO. Wadholm, R. (2016, September). Open knowledge: Social benefits of the hacker ethic. Paper presented at the Midwest Regional Meeting of the Society of Christian Philosophers, Springfield, MO. Wadholm, R. (2016, March). Identity & identicality. Paper presented at the 45th Annual Meeting of the Society for Pentecostal Studies, San Dimas, CA. Gibson, T., & Wadholm, R. (2014, July). The Greek key: New technologies for the analysis of rhetorical figures in classical and biblical texts. Paper presented at the International Meeting of the Society for Biblical Literature, Vienna, Austria. Xing, W., Wadholm, R., & Goggins, S. (2014, June). Assessment analytics in CSCL: An exploratory study of activity-informed method. Poster presented at the International Conference of the Learning Sciences, Boulder, CO.
Wadholm, R. (2014, March). Cognitive penetration of Pentecostal hermeneutics. Paper presented at the 43rd Annual Meeting of the Society for Pentecostal Studies, Springfield, MO. Xing, W., Wadholm, R., & Goggins, S. (2014, March). Learning analytics in CSCL with a focus on assessment: An exploratory study of theory-informed cluster analysis. Proceedings of the Fourth International Conference on Learning Analytics And Knowledge (pp. 59-67). Indianapolis, IN: ACM. Wadholm, R., Early, Z. & Larsen, C. (2013, October). Assessing the Pedagogical Usability of a Digital Resource Sharing Library. In T. Bastiaens & G. Marks (Eds. ), Proceedings of the World Conference on E-Learning in Corporate, Government, Healthcare, and Higher Education 2013 (pp. 208-214). Chesapeake, VA: AACE. Wadholm, R. (2013, October). Distributed expertise: From learning networks to open knowledge communities. Paper presented at the 3rd Annual Ed Tech Conference, Mexico, MO. Wadholm, R. (2010, March). Free and open – Web 2.0 and the extension of Pentecostal education. Paper presented at the 39th Annual Meeting of the Society for Pentecostal Studies, Minneapolis, MN. Wadholm, R. (2007, March). The role of experience in the interpretation of miracle narratives in Lucan literature. In Proceedings of the 36th Annual Meeting of the Society for Pentecostal Studies (pp. 323-330). Cleveland, TN: Society for Pentecostal Studies. Wadholm, R. (2016). Character formation in online education: A guide for instructors, administrators, and accrediting agencies. The Pentecostal Educator, 3(1), 54-56. Wadholm, R. (2009). The world is open. ETR&D, 57(3), 411-412. Wadholm, R. Philosophical notes on being. Wadholm, R. Peter Abelard’s Soliloquy: A translation and commentary. Wadholm, R., McCarthy, L., Winter, C., & Crowe, R. (Trans.) Peter Abelard’s Tractatus de intellectibus: A treatise on understanding. Wadholm, R. (Trans.) Talking to myself: The philosophical soliloquies of Augustine, Anselm & Abelard. 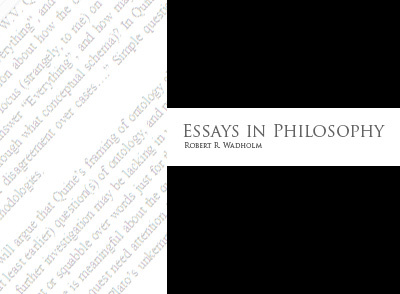 Wadholm, R. Toward a philosophy of open knowledge: A hermeneutical analysis. Wadholm, R. Philosophical notes on Luke-Acts. I have committed myself to serving the professional communities of which I am a part. I am a reviewer for several journals in the fields of learning technologies and education, and have edited numerous books, articles, and journals for colleagues, several of which have won awards and have been featured in the national news (The impact of public officials’ corruption on the size and allocation of U.S. state spending, featured in The Washington Post). 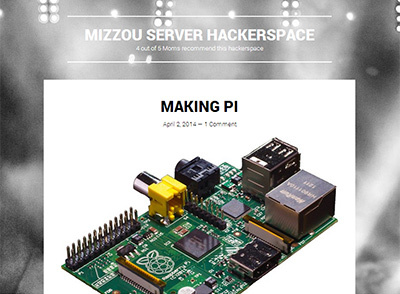 Created the Mizzou Server Hackerspace, a group of undergrad/graduate students who meet weekly to learn and develop Web technologies (2014-present). White, R., & Di Silvestro, F., (2013). Continuing Education in Colleges and Universities: Challenges and Opportunities: New Directions for Adult and Continuing Education. Jossey-Bass. Cho, Y., & Bong, H. (2012). Trends and Issues in Action Learning Practice. Routledge. 20 peer-reviewed journal articles for Dr. Yonjoo Cho (Indiana University), 2009-present (15 were published in journals like Performance Improvement Quarterly, Human Resource Development International, Action Learning: Research and Practice, Action Learning in Practice, International Journal of Human Resource Development and Management, Human Resource Development Review, Human Resource Development Quarterly, and the British Journal of Educational Technology, as well as an article in the Encyclopedia of Management Theory and chapters in several books, all on instructional design, action learning, HRD, HPT, organizational learning, and PBL). Kang, I., Song, J., & Woocheol, K. (2012). The mediating effect of team-level knowledge creation on organizational procedural justice and team performance improvement. Performance Improvement Quarterly. Cheol, L., & Mikesell, J. (2014) The impact of public officials’ corruption on the size and allocation of U.S. state spending. Public Aministration Review. I am an active member in professional organizations in the fields of learning technologies (AACE), philosophy (SCP), and Biblical/theological studies (SBL, SPS). I believe there is a place for learned individuals to meet and dialogue on key issues in a field in an open and straightforward manner. Through my participation, I have had a chance to discuss current research and to involve myself in critical peer evaluation and fellowship. Conferences are an excellent place to be exposed to new ways of thinking, and to meet key figures in a particular field, and are an excellent platform for sharing my own work on learning analytics, philosophy, information and knowledge, technology integration in learning, text analysis, and interpretation (hermeneutics). "Should a Christian be a hacker? Ought knowledge to be free and open? I will attempt to address this question by sketching a three-fold Christian philosophical argument for open knowledge, involving ethical, ontological, and epistemological bases for openness of knowledge. First, I will address the hacker ethic (betterment of society through freedom and cooperation) and relate this to Christian ethical formulations. Second, I will argue that knowledge can exist as a good, and that open knowledge is a fundamentally different kind of good than non-open knowledge. Third, I will propose that if knowledge includes justification, truth and belief, the nature of knowledge carries with it an ethical mandate that touches on how and why knowledge is created, disseminated, accessed and used. I will then briefly address arguments against open knowledge, and summarize how a Christian philosophy of open knowledge might be unique." My system development activities have centered on designing, developing and assessing Web applications. I have built a content management system, a cross-device digital library, a virtual research environment, an activity analytics application, a Web audio book platform, a newsletter application, an iPad application for a museum kiosk, as well as over 100 instructional and informational Web sites and applications. I have been a Web/instructional design consultant for many academic and non-profit organizations including Indiana University, Missouri University, the Oakland Museum of California, Mission Aviation Fellowship Learning Technologies, and Trinity Bible College & Graduate School. I have released much of my work as open source under an MIT/GPL license, and have a passion for training others in the creation and evaluation of Web applications. I am also involved in analyzing and evaluating the systems I have built. There are several articles and presentations in which I describe and evaluate The Little Library (a digital library I created), an activity analytics application (a UI for assessing online chat analytics in an online math environment), and VRE (Virtual Research Environment, an online cross-language text analysis platform). In these examples I have used activity theory several times as a basis for analysis (as it focuses on holistic evaluation of entire socio-technical environments), as well as pedagogical usability tests and phenomenological methods, all from a constructivist bent. In 2013, I coauthored a paper in which we described and evaluated the Little Library, a digital library I designed and developed at Mission Aviation Fellowship Learning Technologies. I developed the application over several years using the scrum method for project management. I used Github for my open source hosting and documentation, and a WordPress blog to describe the process and design decisions along the way (http://www.thelittlelibrary.com/). I implemented this application in several of the courses I taught at the Digital Media Zone, and presented my preliminary findings at E-Learn 2013, in a paper titled Assessing the pedagogical usability of a digital resource sharing library. Activity Analytics, described and analyzed in Xing, X., Wadholm, R., Petakovic, E., & Goggins, S. (2015). Group learning assessment in CSCL: Developing a theory-informed analytics. Educational Technology & Society, 18(2), 110-128. Virtual Research Environment (VRE), described and analyzed in Gibson, T., & Wadholm, R. (2014). The Greek key: New technologies for the analysis of rhetorical figures in classical and biblical texts. International Meeting of the Society for Biblical Literature. The Little Library, described and assessed in Wadholm, R., Early, Z. & Larsen, C. (2013). 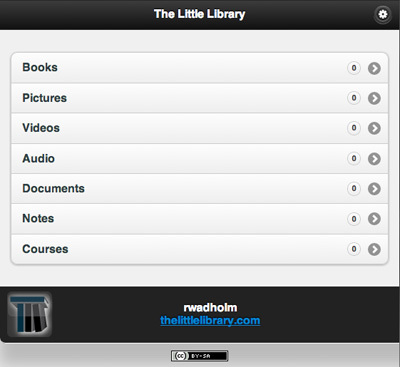 Assessing the pedagogical usability of a digital resource sharing library. In T. Bastiaens & G. Marks (Eds. ), Proceedings of the World Conference on E-Learning in Corporate, Government, Healthcare, and Higher Education 2013 (pp. 208-214). Chesapeake, VA: AACE. Consultant on the design, information architecture, and development of the following Web sites and applications: CultureU, Yellowwood Solutions (a print and Web design company), The Oakland Standard (a blog of the Oakland Museum of California), Mayacamas, and Wedding Fish & Chip Catering. Mission Aviation Fellowship’s Instructional Design Consultant Training Program (along with the director of education services, I analyzed, designed, developed, implemented and evaluated objectives, schedules, syllabi, content, readings, and assignments for a four-month international instructional design consultant program), 2010-2012. Indiana University Alumni Association Web team training (Instructional Designer), 2009.